Ever been "on the spot": at the right place and time? As a fairly avid field collector I try my best to get out whenever possible during any collecting season. I probably get out 9 or 10 times on average between the months of June thru the end of September. I have 5 haunts that I visit and I take a turn or two at each during the season. I know these pretty well (for what they hold); and occasionally have been surprised by new found species. Yet, more remarkable is going to one of these "usual places" and at some point for some reason on that day; I find myself "on the spot" and at the right place and time to collect up something like I have never done before ! This years story goes like this. On September 16th of this year I went to one of my favorite places (which I probably visit 4 times a season). 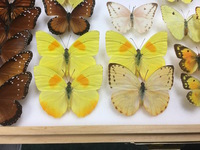 Only on occasion over the last 4 years have I ever seen a singular specimen (here and there) of Eurema lisa; our Little yellow (a diminutive little pierid butterfly). Here, in my region this remarkable little butterfly only seasonally colonizes the area. If the species is seen at all it is usually only found in old fields where it's larval food plant (partridge pea) can exist. So, I basically have only this one site available to me to find this elusive species. Never seen it at any of my other haunts ! Anyway, this day I followed this meandering narrow horse trail thru this immense field (as always); and I came across this juncture point or split in the trail where the trail veers off in 2 opposing directions. At the "mouth" or opening to the start of this secondary trail I stopped and spied it momentarily with the intension of just ambling on my way down the other path I typically take. Well, in that moment of pause at that sunlit opening a Eurema came fluttering out of the overgrown grasses bending over the path. Within maybe 3 minutes yet, another Eurema came fluttering out of the same opening. Before I knew it another Eurema and then another.... Turns out in the short expanse of 25 minutes I bagged 7 Eurema's before the offending mosquitoes drove me from the location. Up until that date and time I had only bagged 3 specimens of this elusive little species (during the last 4 years). I have since been back to that same "spot" twice and yet never have seen another Eurema there... Although, I did manage one on a different portion of the trail at a later date. So, that magic moment was fleeting but, it truly felt surreal and unique for all it's worth. Another instance of this sort of thing comes to mind as related by a friend and fellow collector. Seems he was on a one week holiday in Florida 10 or 12 years ago and his time share location was located only 30 minutes or so from the area of the Florida Everglades. One afternoon, he had some time to collect so he drove on over to the area and started traversing various roads skirting the Everglades in search of possible collecting areas. He lamented that at that time and in that year the rainfall had not been all that substantial so you could actually step from your car and walk into the swamp area a good 30-40 feet without ever touching water and the (substrate would still support your weight). As he drove along seeing nothing but,reeds and other greenery he spied a small lone flowering tree of some sort growing in the swamp just within a nets reach of hitting water. He pulled over immediately realizing this was THE only flowering anything that he had seen in 45 minutes of driving around. He got out of his car and grabbed his net and bag. As he started ambling into the dried periphery of the swamp he saw the large Pierid (Phoebis philea) come flying in to nectar at the flowering tree. Upon, capturing the specimen he no sooner had it in the kill bottle when yet another P. philea came calling. He ended up spending about an hour and a half by this tree before the oppressive heat simply drained him and he had to leave or pass out ! However, in the time he had there (and despite a few misses); he had still managed 10 captures of that most magnificent and very difficult butterfly to catch. Once again "on the spot" at the right place and time ! Reminds me of the well known British lepidopterist Bernard Kettlewell who was on holiday in Cornwall, England during 1945, in two days he had taken over 40 Pontia daplidice and number of Colias hyale and a specimen of Cupido argiades, all are rare British immigrants and of the latter there have only been around 17 records in this country, and of the other two they now rarely if ever in recent years migrant this far north. It was a British collectors dream, he was certainly in the right place at the right time. Needless to say I have never encountered any of those immigrants in Britain and I have been looking at butterflies for over half a century. I guess all those who have taken extreme aberrations or gynandromorphs in the wild, would also count themselves in the right place at the right time, sometimes in spite of all the planning, it down to good old luck. I would say for most butterflies we must be in the right time and place to find them, exception: Pieris rapae. For those unfamiliar with the Orange-barred sulphur (Phoebis philea); here it is in all its magnificence. These four are part of the group of 10 my friend collected at that lone flowering tree in the everglades. The species is very difficult to catch due to its fast powerful flight; unless of coarse you find it nectaring ! female is shown. I have only seen perhaps six of these on the wing and I could never get close enough for a swing. Genus Phoebis is closely related to Asian Catopsilia. Catopsilia species are known from mud puddling behaviour. I suppose that Phoebis is an easy catch lured to urine near streams. I have only collected one species of this genus in Costa Rica : Phoebis argante. I think you just gotta find the right place for them, I too have seen them a time or two up until I discovered the right location for them. I would recommend you find a location near a stream next to an open field with no corn fields around, that may be a little challenging to find in the US corn belt! Once while on my lunch break I was driving past an apartment building near downtown Houston, TX. I spotted several large yellow butterflies hovering around some bushes. They looked too big to be Phoebis sennae, so I parked the car and went to investigate. I was surprised to see that they were Phoebis philea! I grabbed my net and managed to catch a couple of them before heading back to work. I returned to that spot every day for the next couple of weeks and collected a total of about a dozen of them, both sexes. The next year a hurricane blew through and destroyed the hostplant. I haven't seen them since. On another occasion, I stopped at a convenience store to get a drink. When I came out, I noticed a bump in the concrete parking lot that wasn't there when I walked into the store. Upon closer inspection, the bump was a Thysania zenobia. It was camouflaged perfectly against the concrete. I didn't have my net, so I quickly disabled it by pressing my thumb on its thorax. Amazingly, no fuzz came off and I got a perfect specimen. Outstanding tales larrycurlymoe ! Those are some really great species to have found by happenstance. In July in Florida I was chasing papilios around, lots of work with limited success. Then I found a spot between a road and bike trail with 2 meter tall flowering shrubs, about 90sq. meters, with glaucus, philenor, marcellus, and cresphontes all feeding! 1. In France, in Provence, a good spot for Papilio alexanor and Parnassius apollo; I went there three years in a row at the end of June. The first two times, the two butterflies were at the rendezvous. The third time, the emergences were late and none of the two butterflies flew! 2. Still in Provence, on the Montagne de Lure where Parnassius apollo is very abundant at the end of June. Except at the end of June 2018: no P. apollo! On the other hand, the same P. apollo was very common in the mountains of Greece at the beginning of July. 3. 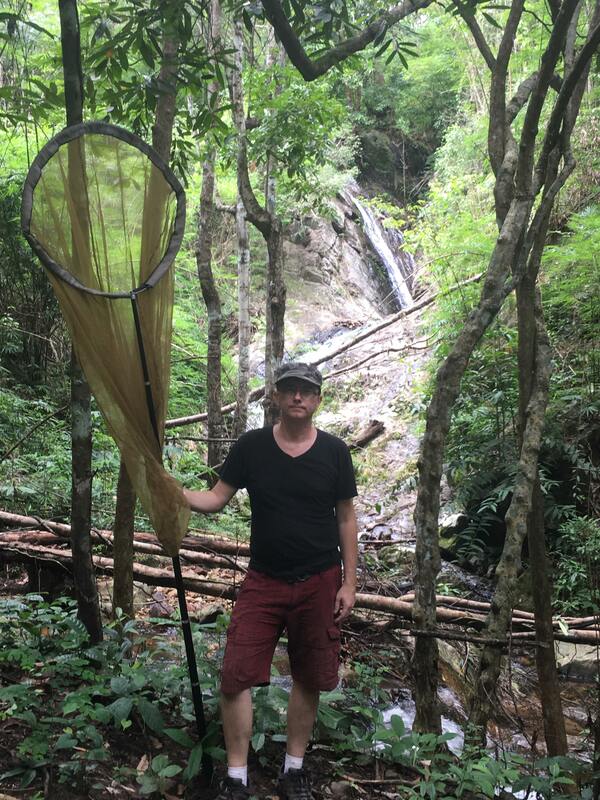 In French Guiana, looking for Morphos. Early November 2017: Morpho telemachus very abundant. It disappears completely after November 24th. Also in November 2017, M. deidamia in quantity, as well as M. helenor and M. achilles. M. menelaus uncommon. In December 2018: few M. telemachus, very few M. deidamia, M. achilles and M. helenor. On the other hand, M. menelaus saw himself by the tens in one morning. As for Morpho hecuba, it abounds in October but disappears in November. 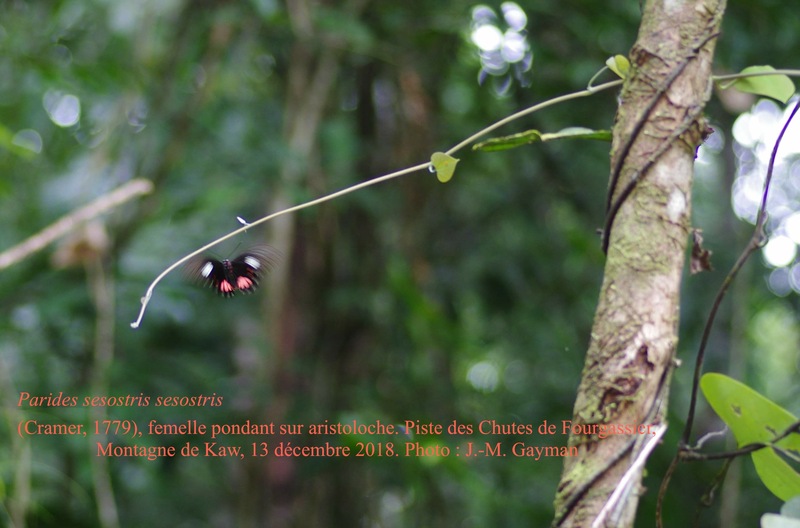 Without even mentioning the case of M. marcus (for short), let us note that of M. eugenia on the Mountain of Kaw: in November 2016 and 2017, I saw at least 15 or 20 every morning between 5.55 AM and 6.15 AM. December 2018: none. Note that this approach does not apply to butterflies of the neighboring Battus genus in Amazonian forest. Always for French Guiana, the best way to meet Parides is to look for still small flowering trees of the species Tabernaemontana disticha. In Ecuador, the Parides forage including Palicourea sp. (Rubiaceae). Needless to say, there is also the presence of aristolochiae in the vicinity. March 2019, I will return for a month in French Guiana: I will see what is flying at this time of the year! I usually go to Guiana in October, November or December. was on that one tree: melinus, cecrops, m-album, calanus, liparops, kingi, halesus, and favonius! On another occasion (early July in the mountains of eastern Tennessee) I found a milkweed patch absolutely full of Speyeria diana. Tons of males and I counted 9 females visible at one time. Unfortunately they were so wary that almost all of them scattered when I caught the first one. Both occurrences were definitely red-letter days! Outstanding stories jmg and jhyatt ! I’ve pondered this from my Belize experience, where we have been documenting the fauna. With over 100 species known from single captures for the country, I guess I have been lucky relative to the “random encounter” of rarely seen species. But here are two better examples from our 20th trip, where we really were in the spot for a couple of great bugs. In 2016, we were supposed to be sampling the “beginning of the rainy season” in Belize. But the rain had not yet started – so everything was incredibly dry. On the edge of the logging town (if you can call it a town) of Douglas de Silva, we found an abandoned road that led up a hill to where the big shoots used to live – hill top cabins, now falling down, that caught a breeze occasionally. The town - Douglas de Silva is in pine habitat, but the hill is an adjacent limestone feature that supports broadleaf forest. There were a couple of low-growing trees trying to bloom (we did really well on some big skippers) but otherwise everything was very dry. But along the road, we encountered a hairstreak that was not supposed to be that far north in Central America - Porthecla porthura. Over the course of a long day, we managed to catch 5 males flying across the narrow road, as they landed on low growing shrubs. Two days later, we saw an additional male – but nothing after that as we stopped to collect over the next few days. That first day was really it for the site. Later on that same trip, we decided we wanted to sample some of the ridge-backs that drop down from the Maya Mountain pine forest towards the rainforest dominated valleys to the east. These old logging roads are impossibly steep – I do not see how they get the timber back up slope because it is pretty difficult just to walk up and down certain parts of the road. At one point, where the road crossed a narrow ridge-top saddle, we noticed a medium sized satyr zooming through the tall forest grasses on the ridge sides. Occasionally, one would fly across the road – and it was flying so fast, I knew that I had never seen the species. They never landed, just zoomed around. I finally figured out a spot where they regularly popped out on to the road, and managed to snag the first Magneuptychia alcinoe known from Belize. Over the next two weeks, we returned to the ridge two more times, and managed to collect a total of 9 specimens from that exact site – plus one other specimen about 2km further down the road – that’s it for the known range in Belize at the moment. We collected a handful of other great bugs on that road, including the only Astraptes apastus known from Belize, but those are just the more typical random encounters you come to expect when you are in the field.